That almost makes up for the Mets losing to the Braves. 4/21 update: Perfect baseball (and perfect spring) day today, as Mets and Sox win and Braves and Yanks lose. When I saw the Braves ahead 9-6 in the bottom of the ninth with one out, I heaved a great sigh. My daughter asked if I was all right. "No," I said, and told her why. "Oh, get over it, Dad," she said. "It's just baseball, a game guys get paid millions to play while kids are starving in Sudan." OK, I'll go to my room and sulk. At least no pundit will be crowing about the restoration of the proper pecking order between New York teams. No, this isn't a global warming alarm. It seems that there were palm-like trees growing in that region in the Middle Devonian, some 380 million years ago (see here). Update: Geology maven Twiffer points out that, in the Middle Devonian, the bit of tectonic plate on which the Catskills now sit was at a latitude comparable to the present-day Caribbean, so the presence of palms, or something possibly ancestral to them, is not surprising. In the space of one hundred and seventy-six years the Lower Mississippi has shortened itself two hundred and forty-two miles. That is an average of a trifle over one mile and a third per year. Therefore, any calm person, who is not blind or idiotic, can see that in the Old Oolitic Silurian Period, just a million years ago next November, the Lower Mississippi River was upwards of one million three hundred thousand miles long, and stuck out over the Gulf of Mexico like a fishing-rod. The image is of the Red Square Nebula, recently discovered in the constellation Serpens by astronomers using the Palomar and Keck telescopes in California and Hawaii, respectively. Credit for the photograph, which I downloaded from AOL News, goes to Peter Tuthill of Sydney University and Palomar/Keck; James Lloyd of Cornell University is credited as co-discoverer of the Nebula. Like the Helix Nebula featured in an earlier post, the Red Square is debris from a dying star; however, it's very neatly distributed debris. You can read more about it in New Scientist here. More confirmation of the Mets/Red Hook augury. As I've noted before, some time ago I thought I noticed a positive correlation between victory for the Mets and the presence during the game of at least one ship docked at the Red Hook container port, visible from the Brooklyn Heights Promenade just a few steps from where I live. There was a ship there Friday, but none yesterday. 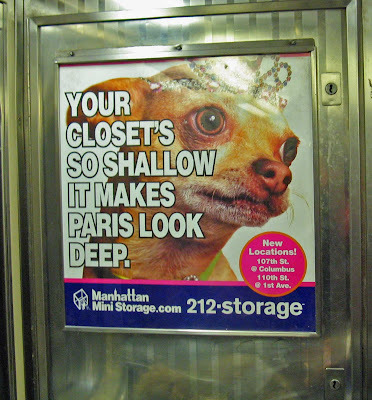 Honest to God, I'm not shilling for Manhattan Mini Storage (but if they happen to see this and give me a concession on my rent, I certainly won't object). Anyway, whoever's doing this ad campaign should get an award.